There is no dark side of the moon, really. Matter of fact, it’s all dark. The only thing that makes it look light is the sun. The Solar System moon we know best is of course our own Moon, and its name in English gets passed on to other satellites. Sometimes people will name it in its Latin form (Luna, from which we obtain “lunar”), but I’ll stick to “Moon” for simplicity: the capital “M” will refer only to our satellite, while the small “m” is the general word. There are many moons, but only one Moon. We know the Moon well enough that I won’t try to summarize all we know about it in one post; expect several revisits on coming Moondays. For now, let’s pass over all the fun stuff we’ve discovered this century and just think about the Moon as it appears in the sky: its phases and its eclipses, in honor of Friday night’s total lunar eclipse. If we view the Earth from a vantage point somewhat over the North Pole, we’ll see a view like this cartoon. As the Moon orbits, half of it is always illuminated, but not the same half. The part that’s illuminated is what we think of as the phase. The 8 pictures around the edge show different phases depending on where the Moon is relative to the day and night side of Earth. 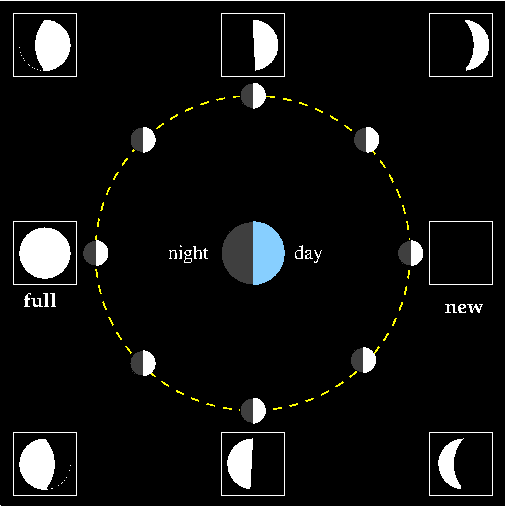 Thus, the full Moon is visible at night, a half-moon will be visible for part of both night and day, and a new Moon is when the whole near side is in shadow. Even when the Moon is between Earth and the Sun, it’s far enough away that its shadow misses us most of the time: that’s what we call a “new Moon” (or more technically the dark of the Moon). When Earth is between the Moon and the Sun, but not directly between, the Sun illuminates the entire Moon, and it appears full to us. The other phases – quarter Moon, crescent, and gibbous – account for the other relative positions of Earth and Moon in their mutual dance around the Sun. The length of time for the Moon to go through all its phases is one lunation: that’s about 29.5 days, which is the basic length of one month in most calendar systems. Since Earth is boogying around the Sun while the Moon orbits, a lunation isn’t the same length of time as the length of orbit (called the sidereal period), which is 27.3 days. This discrepancy combined with the inclination of the Moon’s orbit means that there won’t be a perfect alignment between Earth and Moon except during special times, about twice per year. When the Moon passes directly between the Earth and Sun, the shadow of the Moon falls onto Earth and we experience a solar eclipse. In one of those odd coincidences, the Moon and Sun appear to be nearly the same size in the sky, even though the Sun is obviously a lot bigger. (Lest you think some kind of cosmic perfection is present, recall that Earth’s orbit is elliptical, so the Sun appears to change size slightly over a year. Similarly, the Moon’s orbit is elliptical too, so it also changes size in the sky; that means Sun and Moon only rarely appear precisely the same size.) During a solar eclipse, part of the Sun may be blocked (a partial eclipse), the whole thing may be blocked (a total eclipse), or all but a thin ring of the Sun may be blocked (an annular eclipse). Since the Moon has to be on the same side of Earth as the Sun, solar eclipses can only occur during the new Moon phase. When you put all this together, you can begin to see why eclipses aren’t every month and why not every place on Earth is able to see them. Last weekend’s lunar eclipse was happening just after sunrise for me, so even though I was technically awake, there was nothing for me to see, since the Moon had already set. Similarly, there was a solar eclipse visible primarily in Antarctica about two weeks prior, but most of us, not being penguins, didn’t see that one.